barrier toxicants are toxic to more than just termites. This means that an incorrectly or carelessly applied barrier treatment can affect more than just the termites under your home. As much trouble as they can be to apply properly, termite barriers are still only a passive approach to termite management. This is because termites must attempt to enter a building protected by a barrier to be affected by it. In other words, barriers simpty lay in wait for termite attacks – slowly degrading day by day. 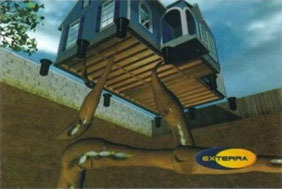 But Exterra is a proactive, go get’em before they get your home, form of termite management. And boy, does Exterra go all out. 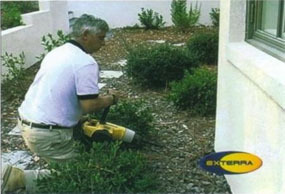 Exterra doesn’t just kill termites when they try to enter your home. It can actually eliminate the termite nest or colony and all its members right in the ground where it lives. Even before it has a chance to think about your home as a food source. Big difference you’ll certainly agree. But how does Exterra provide such a radically more satisfactory and satisfying solution to such an age old problem? does Exterra do this? By addressing the three important keys to termite baiting success. 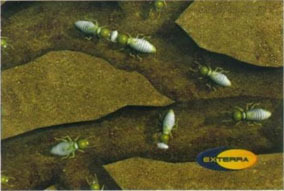 To bait termites effectively, they must first be intercepted at selected points. Exterra does this by taking advantage of the fact that termites continually forage for food in the earth around their nest. Depending on the termite species, points of termite interception may be located both ‘n the ground around the building and inside the building above ground, if termites can be located there. If a food substance is placed at each interception point and there are termite colonies nearby, they will eventually find and begin to consume the food at one or more of these points. For this reason, the first step in the termite baiting process is the placement of specially designed Exterra Stations at carefully selected points in the ground around the outside of your building and, when necessary, inside and above ground. Pieces of nontoxic food that termites are known to prefer to eat are placed in the Stations at the time of Station installation. This substance is referred to as an Interceptor. The Exterra Station is designed to help make sure that termites searching for food in the area of the Station are able to easily find and begin feeding on the Interceptors. The non-toxic Interceptors do not kill termites. They only establish feeding in the Station. Bait is added to the Station after termites are found feeding on the Interceptors. However feeding termites do not like to be disturbed and may even leave the Station if disturbed. But inspecting the Station for termite attack or adding bait means termites have to be disturbed, right? Not with Exterra.